The Knox Bible is the ideal translation for those looking to deepen their understanding of the Holy Scriptures. It was hailed as the finest translation of the 20th Century, approved for liturgical use and was endorsed by Pope Pius XII, Archbishop Fulton Sheen and many more. In the early 20th century, Msgr. Ronald Knox embarked on an entirely new English Bible. He wanted a Bible that did not merely translate the original but made it read as if an Englishman had written it. His translation is spiritual and literary, graceful and lyrical, making it one of the most beautiful vernacular versions of the Holy Bible. Translated from the Latin Vulgate and compared with the Greek and Hebrew texts single handedly by Ronald Knox over nine years. Uses timeless English, which is both sacral and reverent. Set in a single-column format with verse references placed at the side of the text in order to provide a clear and easily readable Bible. 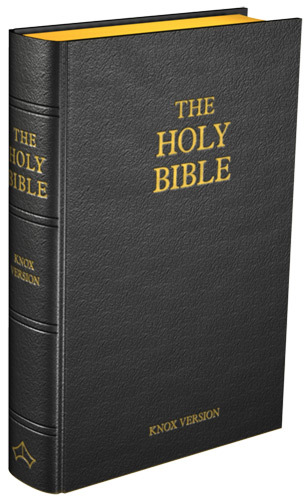 The full Bible is now available again for the first time in over 50 years, in an edition from Baronius Press, beautifully bound in leather with gilt edges. 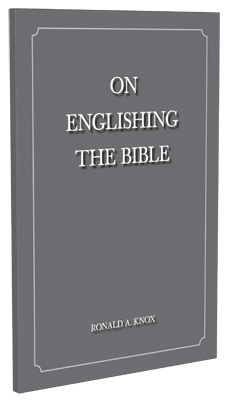 Included with this new edition is a paperback edition of On Englishing the Bible (5.5" x 8", 72 pages) in which Msgr. Knox describes his account of the ordeal, which manages to be both illuminating and full of his wit. Anyone wishing to know more about Knox's translation – and the problems involved in rendering the sacred Scriptures into the vernacular – will be fascinated to hear from the translator himself how he tackled this mammoth project.